How is Montessori different from traditional learning? The Montessori method emphasizes learning through all five senses, not just through listening, watching, or reading. Children in Montessori classrooms learn at their own individual pace. 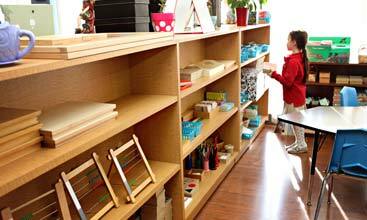 The Montessori classroom contains specially-designed manipulative materials for all areas of learning. Students receive individual lessons from the teacher, making discoveries with the materials while cultivating concentration, self-discipline, and a love of learning. How do the Montessori materials help the students? 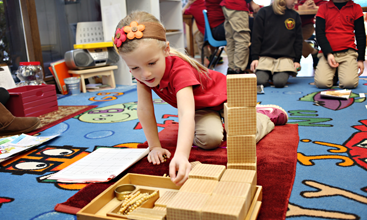 When children look at Montessori materials, they are drawn to explore them with their senses. Materials are multi-faceted and can be used repeatedly at different developmental levels. Montessori materials use real objects and actions to translate abstract ideas into concrete form. What happens in a Montessori classroom? Upon entering a Montessori classroom, the first thing one sees is children hard at work, completely engrossed in various learning activities. Some are working on bead frames, some are engaged in group projects, while others are quietly reading. Brightly-colored materials are found throughout the classrooms, as well as students’ original artwork and even a guinea pig or two. The Montessori classroom is both inviting and engaging. Is there structure in Montessori? There is a balance of freedom and responsibility. Basic classroom rules dictate that a student is free to choose activities, but is responsible to structure choice and time to cover the curriculum. Each student has a plan or goal for the day. Students may choose the order in which they complete their work, as long as it is all completed by the end of the day. If the student does not finish his/her work, it is to be done as homework. Why do the classes have mixed ages? One of the hallmarks of the Montessori method is that children of mixed ages work together in the same classroom. Age groupings are based on developmental planes. Because the work is individual, children progress at their own pace; there is cooperation rather than competition between students. Younger children learn from the older children and older children naturally become classroom leaders. What ages of children does MMA serve? MMA teaches students from preschool through high school. Does MMA have summer programs? Yes. MMA provides an eight-week summer program that allows students to have fun while they learn. During these weeks, we inspire children to learn to cook, to perform science experiments, to become artists, to be more efficient in math and to grow a garden. Each week is dedicated to a different topic. The schedule is flexible, so parents can register children for all eight weeks or just one. We want each child to have a fun summer while learning at the same time! How are the teachers prepared to teach in a Montessori classroom? All teachers must have a Bachelor’s degree and also must have completed the AMI Montessori training to teach at our school. The teacher must be educated in the Montessori philosophy and methodology appropriate to the age level of the students. Is there a religious affiliation? MMA offers the Catechesis of the Good Shepherd, which is a Catholic religious formation program. This program is implemented using the Montessori method, and its goal is to foster a child’s relationship with God using materials, song, art, and prayer. This is offered as an optional course at the school. Do all participate in the Catechesis of the Good Shepherd? No. This program is offered as an optional course at the school. We have students of all faiths, and we respect that. As a Christian school, we start our day with prayer in our classrooms and we say the Pledge of Allegiance. What makes MMA a good choice for today’s families? MMA provides a unique program that educates children for life—preparing them socially, personally, spiritually, and intellectually for an ever-changing world and its challenges. Yes, in some classes. Completing all of the steps in the admissions process and turning in your application by the priority deadline are necessary for consideration. Why do Montessori students achieve at a faster rate than those in more traditional school settings? Montessori philosophy supports following the child, allowing each child to develop at his/her own pace. Stories of Montessori children being far ahead of their peers do not reflect an artificial acceleration; it reflects the outcome of allowing children to follow their interests in an environment that is specially-prepared to foster their maximum development. Is MMA a good choice for gifted children? Yes. Children with learning gifts thrive in a Montessori classroom. There are no curriculum limits either by grade level or content. 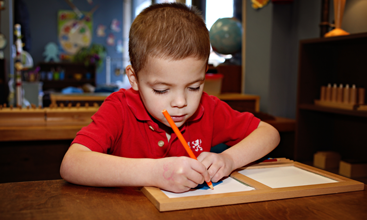 A Montessori child can take learning as far as he/she is capable. Each classroom has an extensive curriculum which includes advanced work possibilities. Gifted children also gain other essential attributes in a Montessori setting because our program incorporates more than just academics. Our mission is for these children to reach their full potential not only academically, but also socially, personally, physically, creatively, and emotionally. How does MMA handle children with learning challenges? MMA supports children with different learning styles. Children with learning challenges will proceed without a loss in self-esteem. If a learning challenge is indicated, MMA will refer families for outside testing and/or services. If a diagnosis is reached, we will determine the best way to meet that child’s needs and form an appropriate and effective learning plan. We work closely with parents, who best know their child’s needs and personality, to help each child be successful.